You will note that the pork belly pictured above is already partly cooked. This is not merely a timesaver but has some collateral benefits as you can see if you follow the directions on my Pork Belly ‘Foodstuffs’ post. 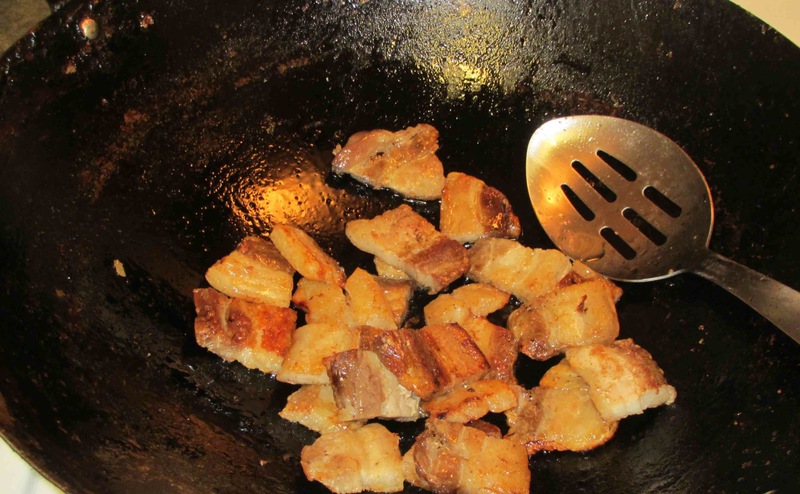 First, heat a couple of tablespoons of oil, or reserved pork belly fat, in a flat bottomed pan and sear the pineapple sections on both sides over high heat. Remove to a bowl and set aside. 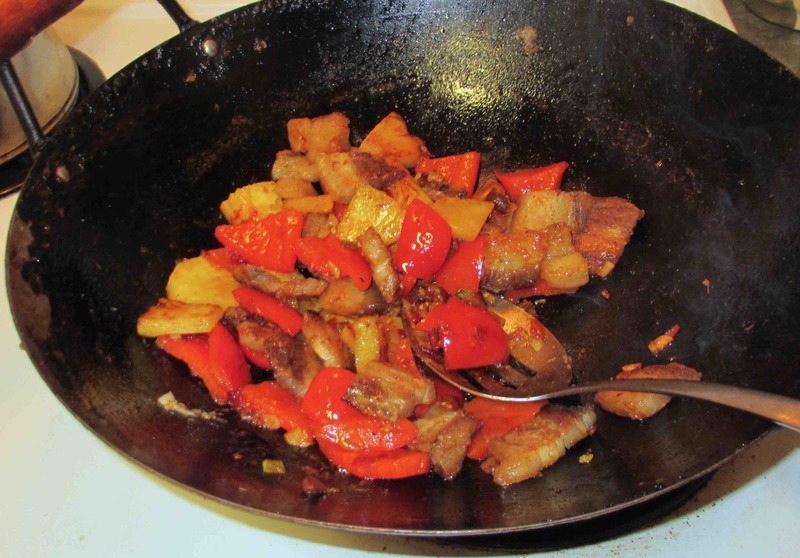 Heat another tablespoon or so of oil in your wok and, when it is almost smoking, add the pork belly slices. 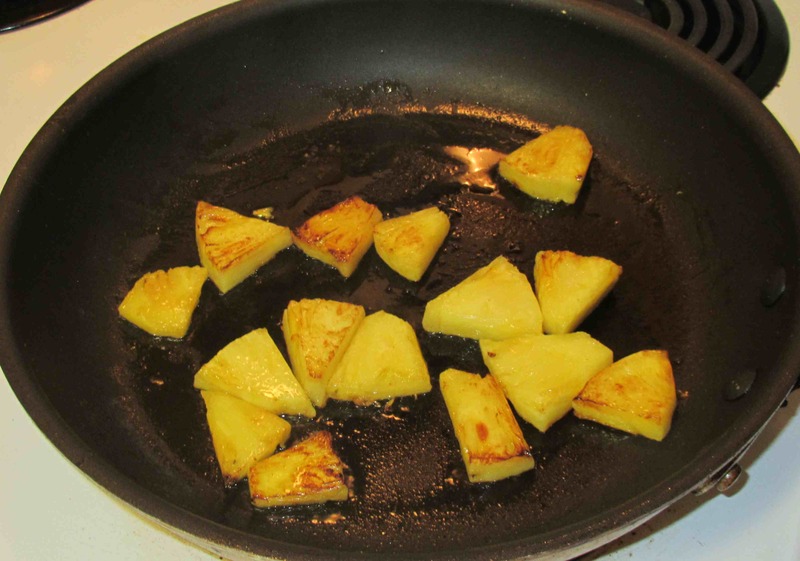 Stir and toss the slices until they are fully cooked through and getting crispy on the outside. Remove them to the same bowl as the pineapple. Add enough oil or fat to the wok so that there are a generous three tablespoons at the bottom and then add the scallion, ginger and garlic. 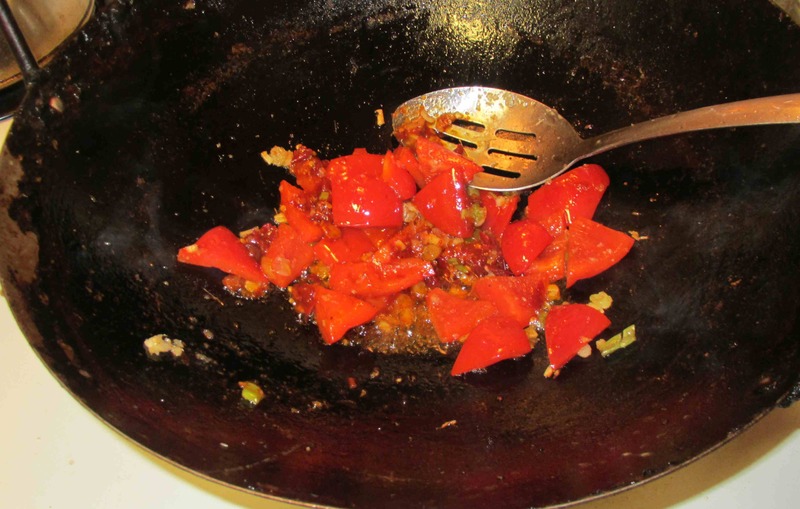 As soon as they release their aromas, throw in the sugar and then the red pepper. Toss and stir until the pepper is just getting soft and then add the sugar and the chili bean paste. 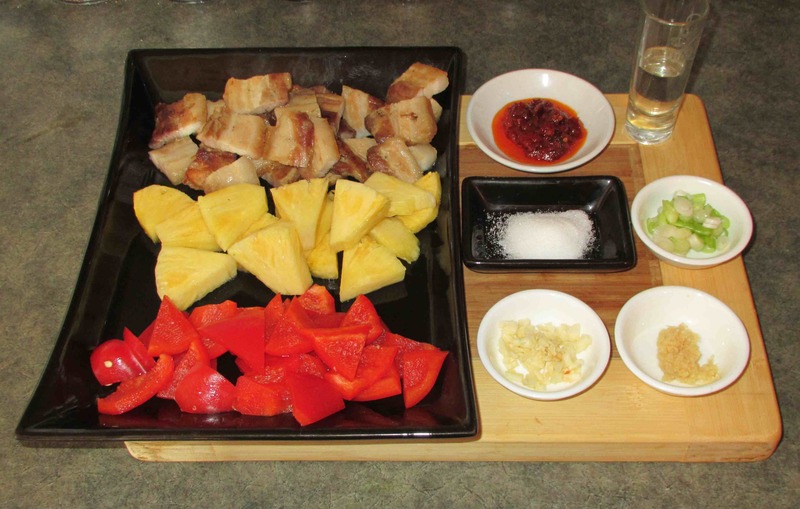 Stir just a few seconds longer and then add back the pork, pineapple and then the vinegar. Stir rapidly until the sauce is thickened and coats all the solid ingredients and then plate and serve. 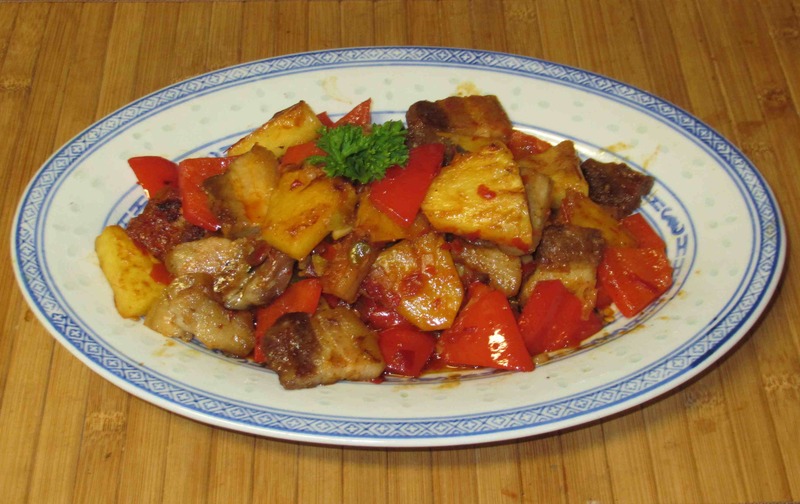 Actually, matchstick shreds of lean pork is a much more common ‘yu xiang’ dish… but not with pineapple. That was pretty much a very nonstandard thing I whipped up… scallion and ‘tree ear’ fungus usually accompany the pork in that version. Also … Yu xiang eggplant is very popular… the eggplant is cut into strips. There are countless recipes for both on the ‘net and I expect I’ll get around to doing one, or both, in one of my posts sometime. I like real chinese food. so many times, people are used to ‘standard’ versions. keep up the good work. here in America, bacon is too trendy…..maple and bacon topped donuts, bacon sundaes, blah blah blah. but this is an excellent use of pork belly. have you gotten the Iren Kuo book yet? when you get it, you’re going to want to sit right down ad start perusing. based on food you’ve reviewd or cooked in the past, I think this is going to fit right in with your library. Hi …. just thought I’d let you know that I have the Irene Kuo book now… you were correct. It is very good, especially for the period in which it was written. I am going through it for a second time now and will probably be reviewing in a post it sometime soon. Beautiful presentation and it sounds delicious! I’ve been browsing on-line more than 3 hours these days, but I by no means found any attention-grabbing article like yours. It’s beautiful price enough for me. In my view, if all webmasters and bloggers made just right content as you probably did, the internet can be much more useful than ever before.